Summary: Ryan Dooley is a teenager with a troubled past living with his uncle to get his life back on track. When a stroll after work leads him to witness a schoolmate named Mark Everley falling from a bridge to his death, he is called in for questioning. The police initially rule Everley’s death an accident but Dooley finds himself under scrutiny from his classmates, teachers, and Everley’s sister who wants Dooley’s help in finding out what happened to her brother. A memorial service/party Dooley attends ends up getting him involved in another murder case when another classmate he has a history with turns up dead and he can’t account for his whereabouts after being drugged. It is up to Dooley to figure out who is really behind the murders before he is arrested. 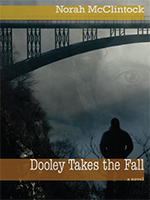 Review: Two mysteries are unfolding in Dooley Takes the Fall by Norah McClintock. The first is the mystery behind deaths of two of Dooley’s classmates. But the second mystery revolves around Dooley’s character. McClintock makes her reader work for every little bit of information about his past and how he ended up living with his uncle trying to make things right as well as how he is connected to the other characters in the story. As a result I found myself frustrated with the stilted pacing and by my lack of knowledge about the main character at crucial moments of the book. Dooley himself is an interesting character though. He has made grave mistakes in the past but he is sincerely working to change things and regrets his past actions. He comes off as a hero in the case of defending Alicia, a girl with Downs Syndrome, from bullies, and as he endeavours to clear his own name he uncovers the real murderers. He’s a real character whoWhat I did glean about his past was intriguing, although the overall vagueness of it left me feeling irritated. But I liked Dooley’s uncle. He’s gruff and pretty hard on Dooley, but he’s also the first one to have his back in the various criminal investigations Dooley finds himself a suspect in. He provides him with a home and keeps close tabs on him, trying to keep him on track as best he can. I ended up wishing I had read a prequel because the story of Dooley’s past was just as engaging as the story McClintock was telling. Perhaps then I would have also had a better grasp on what was going on in this book. I’ve labelled the age range on this book as being for mid to older teens because of the subject matter. I have also left my review vague so the mysteries will be preserved for those who have not read this book before. Readers should be aware that this book contains violence and disturbing themes. Dooley Takes the Fall by Norah McClintock is published by Red Deer Press (2008).